Home / Buffalo / Buffalo Public Schools / CM / Education / National Grid / Sports / ub bulls / university at buffalo / UB once again teams with National Grid Foundation for "Hoops for the Stars"
BUFFALO, N.Y. -- University at Buffalo Athletics and the National Grid Foundation are proud to once again team up with Buffalo Public Schools for Hoops for the Stars. 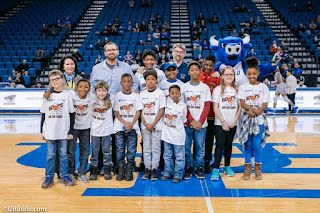 This program connects UB men's and women's basketball student-athletes, coaches and administrators with inner city youth for the purpose of promoting literacy, learning and nutrition. 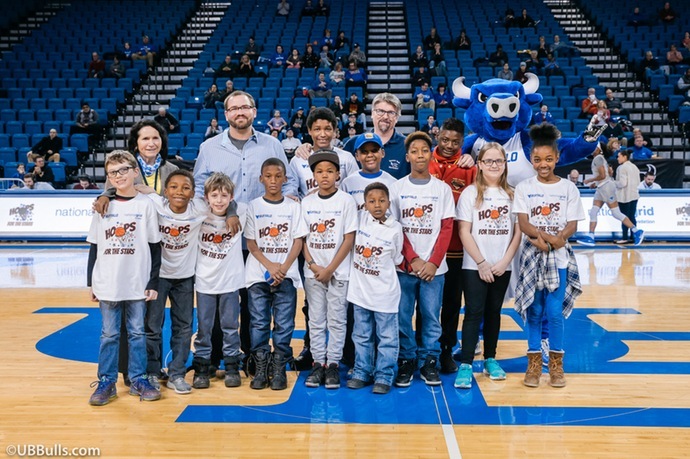 Through a National Grid Foundation commitment of $15,000, UB Athletics will provide men's and women's basketball tickets to several Buffalo Public Schools to reward students that exhibit hard work in the classroom and exhibit positive behavior. UB will distribute 275 tickets to six different men's and women's basketball games this season. "The National Grid Foundation is pleased to again team up with UB for the second consecutive year of Hoops for the Stars," said Ed White, Executive Director, National Grid Foundation. "Through the program, along with inspiration from UB's exceptional scholar-athletes, and program components that recognize the most exceptional students, we hope to stimulate even greater performance in the classroom and community, immensely benefiting students in the Buffalo area." A special presentation recognizing Hoops for the Stars participants will be conducted at the women's basketball game against Ball State on January 16 and the men's basketball game against Eastern Michigan on January 18. "We are thrilled to partner with the National Grid Foundation again this year in support of Buffalo Public Schools," UB Director of Athletics Mark Alnutt said. "One of our core values is community engagement and this is a great program that gives us an opportunity to encourage and reward area students." This year's participating schools are PS 32 Bennett Park Montessori School, PS 94 West Hertel Academy, PS 19 Native American Magnet School, PS 53 Community School, and the Buffalo United Charter School.